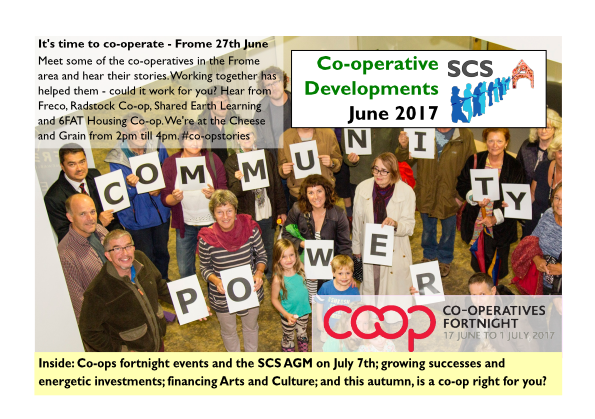 Yes, it's Co-operatives Fortnight 2017 - and after the last year surely it is indeed time to co-operate. To find out how and where, you could do worse than read our summer 2017 newsletter which is now available from this very website - just click here. In this issue, we have two events during C14 in Taunton and Frome; we have the Somerset Co-operative Services CIC AGM in Taunton on the 7th July, which also features the return of the popular Director's Forum. That's a chance for people who are directing or leading a variety of social enterprises to share their experiences, learn from each other and offer support and mutual aid. In addition, we also have updates on social enterprises involved in food and farming; news of innovation in financing community energy; and a sneak preview of the forthcoming workshop in Exeter, is a co-op right for you?